Do you feel like leaving it all behind when you are so close to accomplishing your goals? Yes, your journey so far has been an emotional roller coaster. But the Eight of Cups suggests that before you decide to throw out the baby with the bath water, you’d be wise to consider if the price is right. There is nothing wrong with spending a life of meditation in a Buddhist monastery high in the mountains of Tibet. But before you sell your house and quit your job, you need to be very clear about the long term consequences. The nights in the Himalayas are pretty cold. Moody Saturn is coaxing Pisces, who’s a little gullible at times, into abandoning all interest in the material world. That’s a dangerous mix, considering that Pisces is always eager to martyr himself for a noble cause. Especially when an easier, gentler path can bring exactly the same result! That’s why Kabbalists call the Eight of Cups the Lord of Abandoned Success. There is nothing wrong with taking a step back from the hustle and bustle of the world. The five cups in the bottom row of the Eight of Cups suggest that you’re still reeling from the aftershock of past tragedies and losses. But look at the top row! Divided into two and one, it’s clear that you have learned some important lessons in the process. For example, you have learned about connecting with people in empowering ways. You have also learned something about the nature of pure joy. The moon in the night sky of the Eight of Cups is urging you to seek a more spiritual path. However, the wanderer’s red cloak suggests that your decision to drop everything may be too rash. You’re not at the point of no return yet. Keep going and you’ll pass it sooner than you think. And do you know for sure that the castle on top of those rocky cliffs really is Camelot? Are you sure you’re looking for the Holy Grail? You’ve got your hiking boots on. An inner voice is telling you that it’s time to go forth on a quest. Are you sure you have packed everything you need for the journey ahead? More importantly, is this the right time to leave everything behind? The Eight of Cups tarot suggests a need to withdraw from the world. You are about to embark on an inner journey or travel to another part of the world, searching for something you can’t seem to find where you currently are. 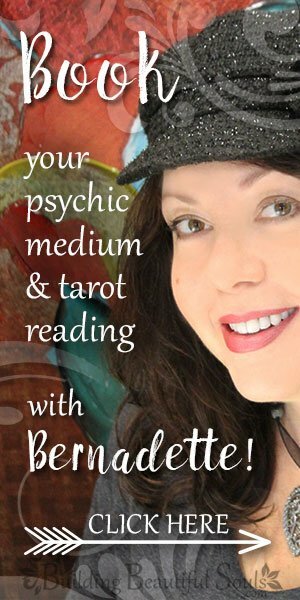 Maybe this quest will bring you spiritual insights and a better understanding of who you are. Or maybe you’re just running away from something you’re afraid to confront. But that depends entirely on you. In a reading, the Eight of Cups card implies a sense of dissatisfaction with your current circumstances – perhaps even the world at large. But being fed up with the way things are doesn’t necessarily mean that you are after spiritual truths. The catch is that you’re very close to accomplishing very important goals right here. So the timing is rather tricky. The thing is that you may already be on your grand quest, and that those impossible tall cliffs in the distance are just another distraction from your real journey. Are you suddenly getting cold feet? Newsflash: Showing that person you can’t commit will do that just fine! The challenge is to be very clear about your motivations and the long-term consequences of the decisions you are about to make. While the hiker in the Eight of Cups tarot is walking across smooth terrain, he can still turn around. But halfway up those rock walls, he’ll be on his own. The Eight of Cups reversed in a reading reminds you that as you reflect on your current situation and what’s truly important, confusion slowly gives way to clarity. As you begin to see the light, you know it won’t be much longer until you have gained the strength and wisdom to make a difficult decision. When that moment comes, you’ll be able to do so in a manner that will still let you look at yourself in the mirror. 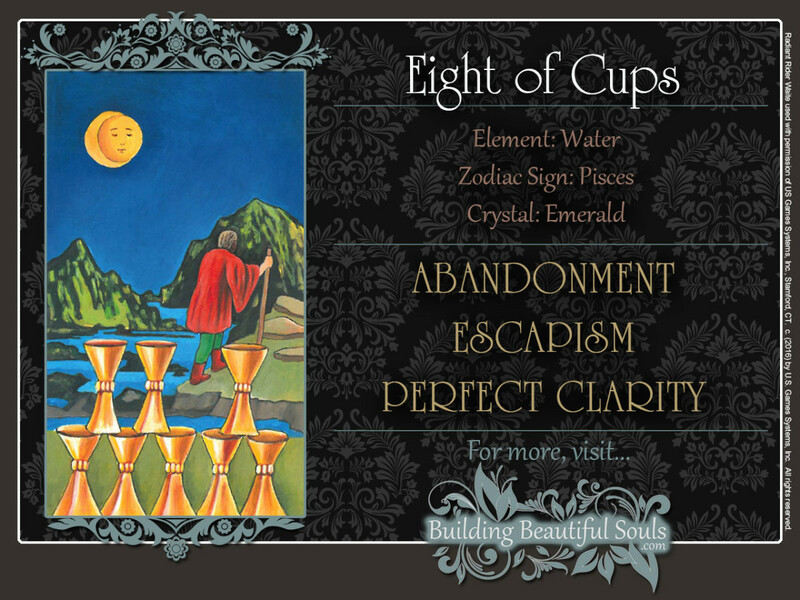 The sense of dissatisfaction of the upright Eight of Cups is still there, but you now have a better understanding of what’s causing it. You also have a better idea of what your goals really are. One thing is certain. You’re determined to resolve this issue in a way that feels right to you. You have grown from your experiences, so your sense of right and wrong is much better defined. Instead of simply shooting from the hip, you can now make decisions that are rational and informed. When the Eight of Cups is reversed, it often suggests that you are ready to leave a situation that’s no longer working for you. You now have the tools that will let you do so without compromising your values. You also have the foresight to end it in a way that doesn’t leave you out in the cold. You may have decided that your current job no longer meets your needs. Chances are, you are already looking for a new one. But instead of just not showing up for work one day, you are resolved to give your boss that two weeks’ notice. If a friendship is coming to an end, you may decide to have a heart to heart talk with this person first. It’s better than not answering his calls without telling him why. Yes, it will be painful. But you know you owe him at least that much, no matter who is at fault. Kabbalistically, eights are associated with Mercury’s wanderlust. In traditional Numerology, 8 symbolizes Saturn’s often self-destructive impulses. In the Eight of Cups tarot, you are cautioned to take a close look at your motivations. Are you destroying the old to make room for something new and better? Or is this destruction senseless.